Throughout history, welding one thing to another thing has produced monumental innovations. The beer helmet. Grass sandals. The gunblade. 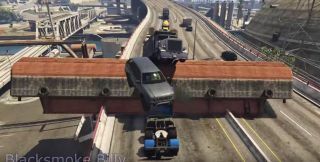 Now, making use of sjaak327's Simple Trainer GTA 5 mod, YouTuber and madman BlackSmoke Billy has birthed a truck that hurls cars tens of feet into the air against their will. What a time to be alive. Surely this inspirational work will find a home on our list of the best GTA mods.